It looks like summer is officially saying good-bye and my favourite season is just around the corner. In just a few week days got so much shorter, the terrible heat has finally left the town and even the nature has started its beautiful transformation. So at this point the only thing I wish for are as many sunny days as possible, because even though I love fall, rainy days can make this beautiful season not so beautiful after all! Love this outfit and these pieces are so pretty. Very nice jacket. I'm also looking forward to autumn and start layering up clothes! OMG this jacket is amazing, i love it. Feel free to visit my blog, and see my new post. je jopic iz aktualen kolekcije? I love the outfit. The jacket is amazing!! 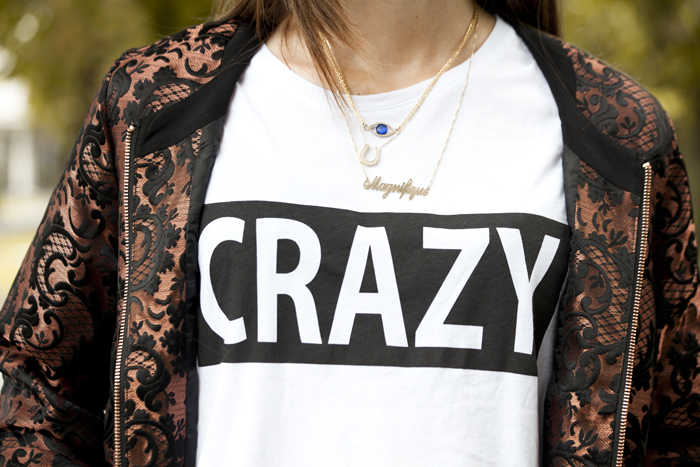 What a fabulous jacket, such a cool way to make that fun crazy tee look super chic! These photos really look like fall! :D But I love them, just like your outfit! Amazing style! We follow you on gfc by now! Very nice style love this jacket.